This is a Disney revue from the late 40's, when animation had a kind of hand-held charm: Nine episodes -all musical- featuring voices of the era such as Dinah Shore, Nelson Eddy and Jerry Colonna -who recites Casey at the Bat. Nelson Eddy gives us the charming tale of the Whale Who Wanted to Sing at the Met, and Benny Goodman is on hand in a jumping dance called All the Cats Join In. Like any revue, it's spotty, but if you're a fan of early Disney (Dumbo, Bambi, Pinocchio, etc.) there's a lot to like here. The songs are by the likes of Allie Wrubel, who wrote Zip-Ah-Dee-Doo-Dah. 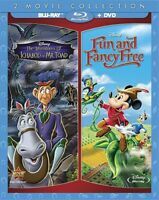 An even better double-feature (two 40 min episodes) is Ichabod and Mister Toad; look for it. not as good as the original. disney edited content to make it p.c. still very good. The "Peter and the Wolf" cartoon is the reason for this purchase! It is very engaging and not too scary for young children. Disney has taken the fun and familiar symphonic fairy tale for children by Sergei Prokofiev and added a narration by Sterling Holloway (voice of Winnie the Pooh). I loved this as a child and now my grandchildren love it; especially the boys who would never just listen to classical music. Other Disney cartoons are included, but they made a big mistake not calling this DVD "Peter and the Wolf". Fabulous! As soon as I found this I couldn't pass up the opportunity to purchase it. They don't make them like they used to! Great deal and I remembered it from when I was younger. It is such a good series of cartoons! My daughter wanted the cartoon called Johnny Fedora and Alice Bluebonnet which she loved as a small child (She's now 32!) 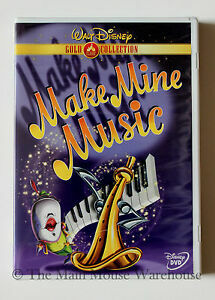 Found it on ebay and ordered it and was very pleased with the dvd. My daughter actually had tears in her eyes when she opened it on her birthday. It certainly brought back many good memories for her. The other cartoons are also wonderful and we enjoyed watching them again (after all these years). Can't thank you enough for having this dvd on you list of things to purchase.